The Hampton Inn and Suites Orlando-John Young Pkwy/S.Park hotel is the premier hotel choice in the south Orlando Florida area. This hotel has a professional staff that is ready to cater to your every need while you enjoy the excitement of the city. 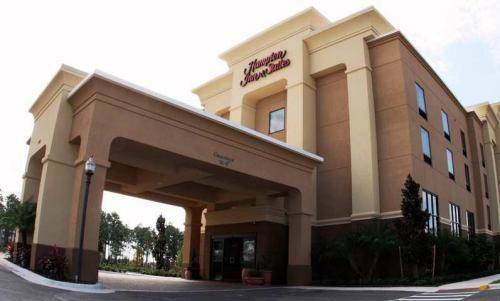 The upscale Hampton Inn and Suites Orlando-John Young Pkwy/S.Park Florida hotel features 61 lavishly appointed guest rooms and 22 studio suites all featuring microwaves and refrigerators. Guests are conveniently located in the South Park Office area of Orlando and only blocks away from shopping and restaurants. The Hampton Inn and Suites Orlando-John Young Pkwy/S.Park Florida hotel is also only two miles from the Sea World Adventure Park five miles from Universal Orlando and eight miles from Walt Disney World. The Orange County Convention Center is only two miles away from the hotel. The Hampton Inn and Suites Orlando-John Young Pkwy/S.Park Florida hotel is proud to offer Hampton*s signature On the House hot breakfast with rotating menu items. This upscale Florida property also features wired and wireless Internet Access throughout the hotel on-site exercise facility with state-of-the-art equipment an outdoor pool a 24- hour business center a meeting room to accommodate up to 40 people fresh hot coffee and tea in the lobby 24/7 and of course Hilton HHonors Points and Miles for your stay. We love having you here at the Hampton Inn and Suites Orlando-John Young Pkwy/S.Park Florida hotel.